Pollice Verso ("Turned Thumb"), by Jean-Léon Gérôme, 1872 (Oil on Canvas, 38 x 57 in). 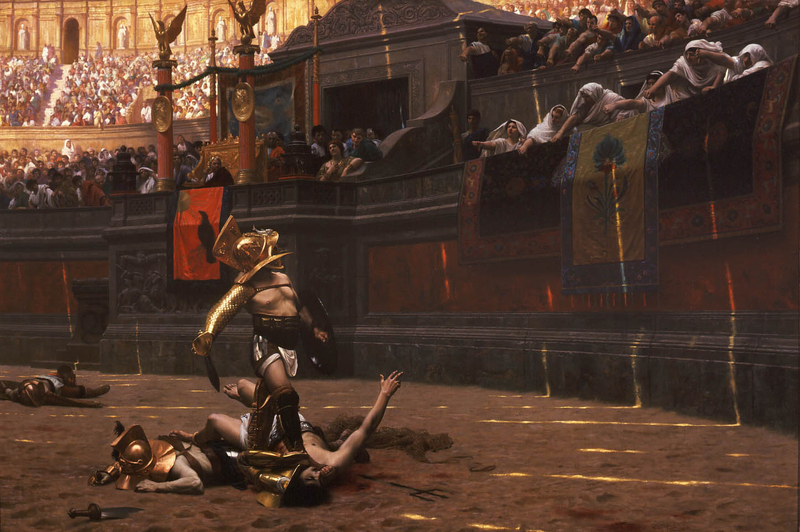 The Pollice Verso, or ‘Turned Thumb’, by French painter Jean-Léon Gérôme, captures the drama of the gladiatorial spectacle so intoxicating to Alypius in book 6 of the Confessions (the painting was reputedly a central inspiration for the makers of the movie Gladiator). Scholars now know that the signal for the victorious gladiator to kill his opponent was an upturned thumb, and the signal for mercy was closer to a closed fist. See also: A. Corbeill, ‘Thumbs in Ancient Rome’, Memoirs of the American Academy in Rome (1997), 42: 1-21.